Fire extinguisher speaker mod looks great, sounds tinny? 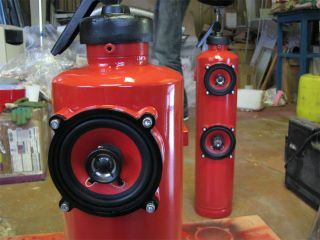 These are homemade speakers crafted from empty fire extinguisher canisters. An extremely talented DIYer posted a photo step-by-step guide of how he built these bad boys, which is handy because the rest of the instructions are in Russian.